Stay tuned for upcoming events for Air Nexus in near future. Air Nexus 2018 will take place from 9th to 11th March 2018 at Air University in Islamabad, Pakistan. Farhan Saeed and Abdullah Qureshi will perform live on 9th March 2018. It is being organized by SK Saad Khan Event Management Company. 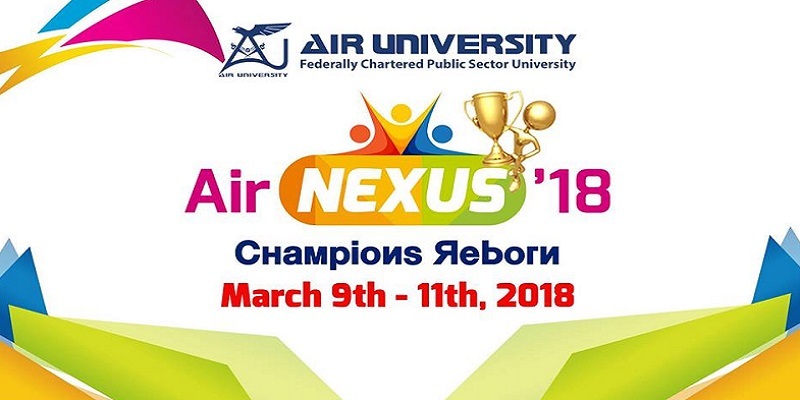 AirNexus is an annual Olympiad which is hosted by Air University in the Spring semester. Come and listen to the mellifluous voices of the rocking artists. They will mesmerize fans with melodious music and famous songs. Air Nexus is an Olympiad which provides students an opportunity to participate in different intra university competitions. AirNexus '16 was the first ever Intra University set of events held on 29th April to 1st May 2016. AirNexus '17 was staged from 3rd to 5th March 2017. AirNexus '18 is the third edition which is going to run at Air University on Air Nexus. Best Viewed at 1024 x 768 pixels and above. This Page loaded in 0.06534 seconds on Tue, Apr 23, 2019 (20:55).